This volume presents a wide-ranging review of the latest developments in concrete technology that have been largely missing from the global conference circuit. It the first major international event under the auspices of the Institute of Concrete Technology (ICT) and is appropriately located in the Middle East at the heart of a construction boom. Themes covered include admixture technology, durability, mix design, special cements and supplementary materials, reinforced concrete and sustainability. 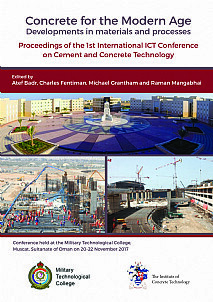 The 39 papers provide interesting theory and applicable practice blended with research findings – from the application of 3D printing to performance-based specifications and the role of concrete in the development of Oman – to produce a volume of value to many engineers and technologists. Founded in 1972, The Institute of Concrete Technology (ICT)’s mission is to preserve and promote concrete technology as a recognised engineering discipline and consolidate the professional status of practising concrete technologists worldwide. It is the concrete sector’s professional development body, operating internationally, with some 500 members in more than 30 countries. It is an awarding body for qualifications in concrete technology and a facilitator of continuing professional development (CPD) and networking opportunities. Our partner in this conference, The Military Technical College in Muscat, Oman, was established with the intent of becoming a Center of Excellence in engineering education. Located in one purpose-built, state-of-the-art, well-resourced center, the intent is that MTC will be amongst the world's best in the field of military and applied non-military technological education and training providers in the world. This volume will provide a valuable tool for practising engineers, designers, contractors, researchers and advanced students in civil and structural engineering, and concrete technology. Scientists and engineers in the associated disciplines of materials science and engineering, materials chemistry and construction will find much of interest.